Over 200 Powerful and Challenging Devotions to Strengthen, Encourage and Inspire You in Your Divine Calling as a Wife and Mother. You’ll want them beside your bed to read before you get up to face the day and to inspire you as you go to sleep at night. I use these books in my daily quiet time and am encouraged in my role as a wife, mother and grandmother. I finished them, and am going through them for a second time. We older women have the ministry of teaching and encouraging the younger women, and Nancy's devotions are a valuable help in pointing them to the Scriptures. As a rabbi's wife, I use them as a tool in encouraging women in our Messianic Synagogue. These books are treasures, and I know they'll bless and help women of all ages. I love to give them as gifts, too. This devotional has been a blessing to me so far! I love it and look forward to being able to read it each morning! Thanks for writing it! I am loving this devotional, and I am pretty picky!! She sheds truth in a balance and gives great encouragement along the way. So far, gems in each page!! Loving it and plan to buy more to encourage other mothers with it!! The best I have ever bought! I LOVE this devo so much it really puts what is most important in this life on the for front of your heart! I hope there are more made I am sure Nancy can write one on several other topics. 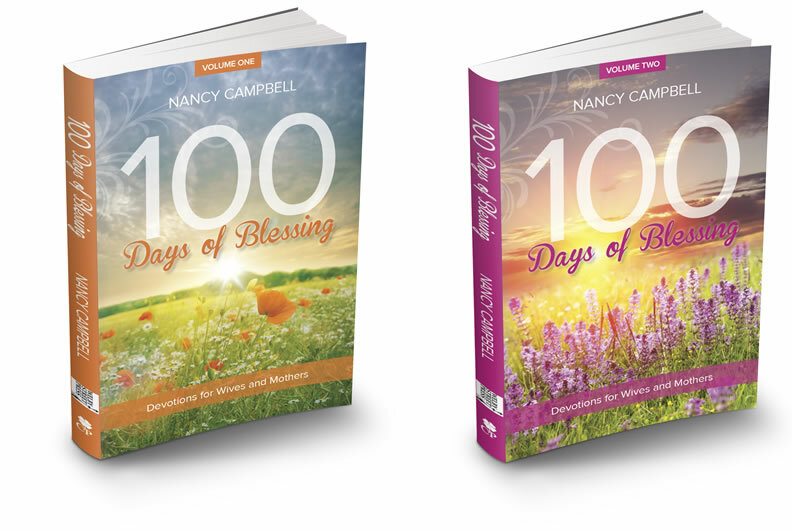 Click the button below to add the 100 DAYS OF BLESSING - VOLUMES 1 & 2 to your wish list.